Buy the poster here. See in huge proportions here. 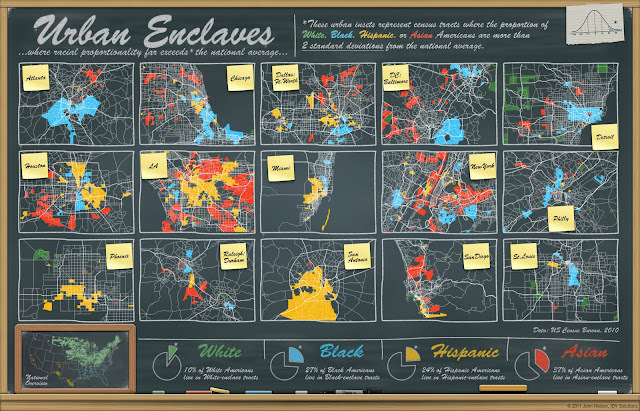 As a follow-up to the American Enclaves chalkboard map (thumb below), which showed the national distribution of racial proportion outliers, here is a closer look at some of the larger cities in the United States and their areas of way-more-than-average-populations of various ethnicities. Some time ago Matthew Bloch, Shan Carter, and Alan McLean of the New York Times put together an interesting dot density map of these races. This map borrows from that notion but isolates areas to only those where the rates are statistically marginalized from the national means. Of note, in the whole of the country only a handful of census tract outliers overlapped races (more commonly asian, since their comparatively lower national rate makes for an easier outlier qualification). Thumbnail of the national enclave map. More on this here.